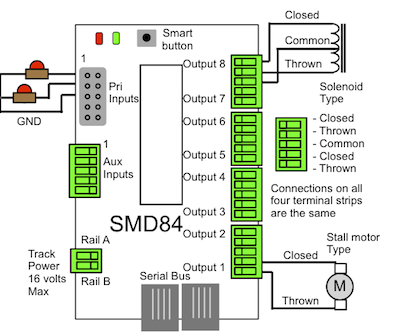 The SMD84 is an eight (8) output DCC accessory decoder (HO & N scale) specially suited to drive 3 wire solenoid type switch (turnout) machines. It features 13 local inputs and 8 routes. The SMD84 is not fully compatible with the Atlas, Backmann or MRC (except Prodigy Advance) DCC systems because they do not support accessory commands or can not program the number of CVs in the SMD84. The SMD84 will not drive SwitchMaster, Cobalt, Scale Shops, Switch Tender or Fulgurex motors. Note: 1/22/15 the Cobalt iP Analog has a much lower current requirement and should work oK.